Octaleus is the device with the longest battery life. With reports set for once daily, the device will work for 4 months on a single charge. Octaleus’ operations is driven by the customer defined schedule. 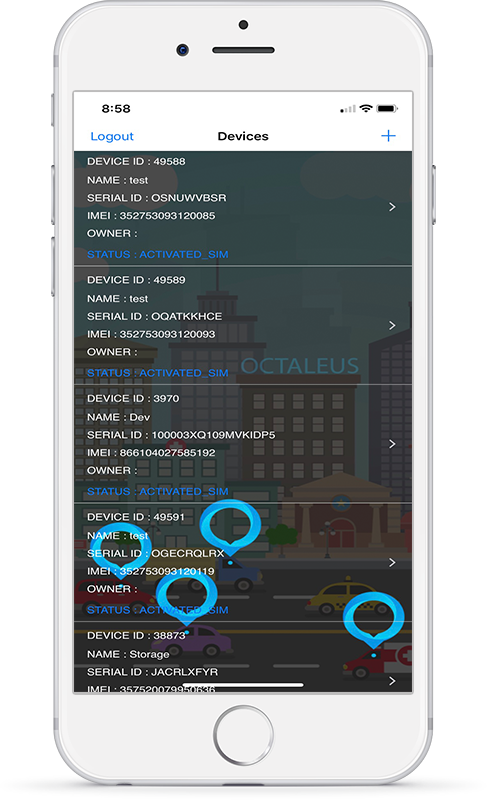 Using our free Octaleus mobile application (iOS or Android), the customer can define the frequency of the location reports. These reports can range from every 10 minutes to once a day. The battery life depends on the frequency of the reports. More reports per day – shorter the battery life. Between the reports Octaleus is in the sleep state, preserving the battery. Octaleus uses an accelerometer to detect different types of motion. Now you can trigger Octaleus to report when motion is detected. Very useful when monitoring the health of an asset during transport. In many cases it’s important not only to know where the Octaleus device is but to be alerted if it has been removed from the designated area. Define your Guard Zone by specifying the radius on the map and once the Octaleus device leaves it, you will receive an alert on your mobile phone. You can also be alerted when the device is back in the Guard Zone. Octaleus comes with 2000 location reports that has an expiration time of 1 month. After that you can subscribe to either an annual or monthly service plan. Each plan has an unlimited number of reports.